Children's Stories - An Australian Adventure - "Maya, the Lost Child"
The eucalyptus trees swayed in the hot summer wind. Maya’s mum spread a green and white checked tablecloth on the grass. The family picnicked on bunya-bunya, wattle seed bread smothered in lillypilly jelly, yabby, and dried quandong. As Maya wiped the sticky jelly from her chin, an electric blue butterfly fluttered past. She chased it deep into the bush, giggling as its large wings moved up and down. "Don’t wander too far," her mum shouted. When the butterfly disappeared among the treetops, Maya noticed the strange shapes of the baobabs. They were twisted and bent and looked like hungry monsters. She felt frightened when she realized that she was lost. "I want my mum," she sobbed. Tears fell from her eyes, rolling down her cheeks to the ground. "Why are you crying?" Maya turned around. "Are you lost?" A small kangaroo smiled at her. "My name’s Boomerang," he said. "You’re a joey. Where’s your mum?" Maya asked, wiping her tears away. "Come along with me. My mum will help you," Boomerang said. He took her hand and they walked past a freckle tree deeper into the woods. "Mum!" he shouted. A huge red kangaroo hopped towards them. "Who’s this?" Wandi asked. "My name’s Maya. My family and I were having a picnic and I ran off after a butterfly. It was blue. I’m lost now," the little girl cried. "Why don’t you and Boomerang climb into my pouch? We’ll hop around and see if we can find your family," Wandi said. BOING! BOING! BOING! "It’s warm in here," Maya whispered to Boomerang. Wandi bounded into the bush. Maya saw pink daisies, yellow button flowers and trees filled with colorful cockatoos. Wandi stopped to rest at the bottom of a tall eucalyptus. Maya and Boomerang giggled and talked. "What’s all that noise down there?" the koala asked. "Can’t you see I’m trying to sleep?" "Sorry. Maya’s lost and we’re trying to find her family. Have you seen them?" Wandi asked. "You’re high up in the tree. You can see everything from up there." Banjori answered, "I can’t see anything but trees. I’ll come and help you if you’d like. I’ve got a keen sense of smell." The koala climbed down. "Any room for me in there?" he asked. "Climb in," Boomerang said. "There’s plenty of room in my mum’s pouch for the three of us." Banjori’s fur was soft and fluffy and tickled Maya’s arms and legs. Wandi hopped away, going deeper and deeper into the bush. BOING! BOING! BOING! "What was that noise?" Maya asked. Wandi stopped. They saw a kookaburra sitting on the branch of a gum tree. "Why, it’s only a bird!" she said. "What do you mean, only a bird? I’m a kookaburra. 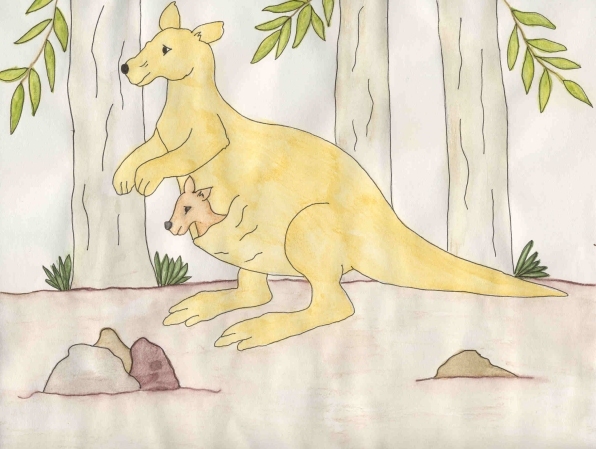 It’s not every day you see a kangaroo hopping through the woods with a child and a koala bear in her pouch with her joey. LAUGH! LAUGH! LAUGH!" "Maya was having a picnic with her family and ran after a butterfly," Boomerang said. "I got lost. Wandi, Boomerang, and Banjori are helping me find them," Maya explained. "Do you want to come and help us?" "I’d love to help." She flew down from the branch and stood in front of Wandi. "My name’s Yindi. Is there room in the pouch for me?" she wondered? "Climb inside," Wandi answered. "You’re small. Squeeze in next to Boomerang." Wandi hopped off into the bush, carrying the others. BOING! BOING! BOING! "Don’t ruffle my feathers," Yindi squawked as Boomerang moved about in the pouch. "What’s that hole up there?" Banjori asked, pointing to a spot near the roots of a paperbark tree. A small head poked out. "What’s all that thumping? I’m trying to take a nap!" Daku, the wombat, snarled. "Me too," Nimu, a small trap door spider growled, sticking his head of a much smaller hole. "And what is a kangaroo doing, hopping around the bush with a child, koala, and a kookaburra in her pouch with her joey?" Daku asked. "She’s lost," Yindi said, pointing to Maya. "She was chasing butterflies and lost her family. We’re all trying to help find them. Do you want to come with us?" "What about me?" Nimu asked. "I can help! I’m small and can fit in places that you all can’t." "Climb in," Wandi said. "There’s room for you both." The wombat and the spider squeezed into the pouch, next to Banjori and Maya. "It’s getting crowded in here," the koala mumbled. "Keep your claws to yourself," he warned the wombat. Maya looked at the animals and started to giggle. "This is fun. You’re all going to help me find my family soon." Wandi hopped into the bush, heading for the river. BOING! BOING! BOING! "Banjori, get your foot out of my ear," Daku whined. "Boomerang, you’re tail is poking me in the back!" "Stop complaining," Maya said. "There’s plenty of room for us all." "Did you see that?" Boomerang said. "It was a big snake!" He gulped in terror. "It wasn’t a snake," Nimu said, "it was a lizard." "It had a long tongue, just like a snake, and it slithered," Maya added. The lizard came out from behind the rock. "I’m a skink, if you don’t mind. My name is Tinka," she hissed. A long, blue tongue darted out of her mouth. "I’m not a snake." She looked at Wandi. "What in the world are you all doing in the kangaroos pouch? Only the joey should be in there." "Maya got lost and we’re helping her find her family. You can come and help us, if you’d like," Nimu said. "Get into the pouch with all of you? I know kookaburra’s like to eat skinks," Tinka said. "But you like to eat spiders and I’m in here. Come and help us," Nimu pleaded. The skink slithered across the ground and climbed into the pouch. "I’ll stay over here though, away from the kookaburra, if you don’t mind." "Good idea. Stay way over there, away from me," Nimu said. Wandi hopped away, carrying Boomerang, Maya, Banjori, Yindi, Daku, Nimu, and now Tinka in her pouch. BOING! BOING! BOING! The bush was filled with acacia trees, pretty flowers and sweet scents. "I’m thirsty," Boomerang complained. "Can we stop and get a drink, Mum?" Wandi found the nearest pond. Maya and the animals crawled out of her pouch. "I’m not drinking pond water," Maya said. The rest of the group gulped refreshing sips from the pond. "I’ll wait and get a drink later, when we get to the river." "What are you all doing at my pond?" Kiah asked. The platypus came out of the water. She had bits of reeds sticking to her soft, furry body. The kookaburra explained, "We are helping Maya find her family. She’s lost in the bush. LAUGH! LAUGH! LAUGH!" "Looks to me like you’re all lost. Do you have any idea where you are?" Kiah wondered. Wandi looked at the others. "I suppose I’m not sure where we are. I’ve just been hopping about, looking for Maya’s family." "If you’ve been hopping about, what have all the rest of them being doing?" Kiah asked. "We’ve been in the pouch," Banjori replied. "All of you have been in the pouch, with the joey? How on earth do you fit?" Kiah giggled, trying to picture them all in the pouch. "We fit just fine," Daku said. "Would you like to come with us? We could use some help finding our way back to Maya’s family." "It would be rather a tight fit, but if you don’t mind, I’ll come along. I think you need some directions," Kiah smiled. They squeezed into Wandi’s pouch. "It is rather cozy in here," she added, moving Boomerang’s tail out of her bill. Wandi hopped away, heading back the way they came. BOING! BOING! BOING! "Are you sure we’re going the right way?" she asked the platypus. "I don’t remember seeing these macadamia nut trees before." "I don’t remember seeing these pandanus palms either," Tinka hissed. As Wandi hopped along, she stepped on something prickly. "Ouch! What was that?" She stopped and looked down. "You stepped on me!" the echidna said, rubbing her spines. "I think it hurt me more than it hurt you," Wandi said, rubbing her sore foot. "You’ve gone and bent a few of my spines, you clumsy kangaroo," Jiba spat. She looked at the pouch. "What on earth? 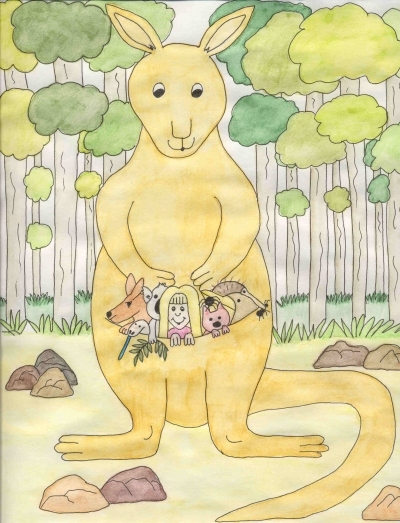 What are all these animals and a child doing in your pouch?" "The little girl is Maya. She’s lost. We’re all helping her find her family, though I must say, we’re not doing a very good job of it. They were having a picnic in the bush. I’m afraid we’re all lost now," Wandi said, quite embarrassed. "Do you want to come with us?" Nimu asked. "Me? How could I ever fit into the pouch with all of you in there?" Jiba asked. "There’s room for one more, but that’s it. I can hardly jump any more, but if you’d like to help, we could surely use it," Wandi said. "I’ll come with you. I’ve been around the bush and know my way," Jiba said. She climbed into the pouch. "Ouch! Your spikes are sharp!" Daku moaned. "I’ll try to be careful with them. I suggest we head to the billabong. We had a rainy season and it’s quite full. We can all have a rest and something to eat," Jiba suggested. Wandi hopped towards the billabong. BOING! BOING! BOING! "It’s beautiful," Maya said, when they arrived. Water lilies floated on top. "It’s so quiet here. I think this is a good place to rest." "Why don’t you all climb out of the pouch and go in search of food. See what you can find and bring it back," Wandi suggested. A while later the group gathered under a baobab tree. "Let’s see what we have here. There are some witchetty grubs, billy goat plums, bush tomatoes, wild limes, illawarra plums, and an assortment of roots and seeds. I think there’s something for everyone here," Jiba said. "I eat bugs," the skink said. "Go and dig some up," Nimu said. "I’ll come with you. I eat bugs too." "I eat eucalyptus leaves," Banjori said. "I’ll climb the nearest tree and nibble away." After they had feasted and had full tummies, they lay down for a nap. Just then they heard a strange noise. It was a car honking. "Maya! Maya!" her mum shouted. "We found you!" Maya jumped up and ran to her mum’s arms. The animals were afraid and darted into the bushes and up the trees. "I was lost, Mum, but my friends helped me out." Her mum looked around. "What friends? I don’t see anyone." "Wandi, Boomerang, Banjori, Yindi, Daku, Nimu, Tinka, Kiah, and Jiba," Maya said, wondering where her friends had disappeared. "Who is Wandi and Boomerang?" her dad asked. "I think you’re tired. Let’s get you home," Mum said. Dad scooped her up in his arms and carried her to the jeep. As she drove off, the animals came out of hiding and waved goodbye to her. She waved back. "I’m glad she found her family. What about the rest of us? We’re all together now. I say we stick together. It’s easy to get around in Wandi’s pouch. You don’t mind sharing, do you, Boomerang?" Yindi asked. "Not at all. I like having the company. We’re all friends now. That’s good," he chuckled. "We’re still lost," Daku reminded them. "We’ll spend the night here, at the billabong, and tomorrow morning we’ll try to find our way back. After all, we all know where we’re going, don’t we?" Wandi laughed. "LAUGH! LAUGH! LAUGH!" cried Yindi, and then they fell asleep as the bright summer moon shone down on the billabong.